Between the pages with Aperture books – Back covers for mini books! This post is a long and perilous journey into the technical abyss! If you’re currently grinding towards a deadline on a crucial project, and simply must know how to put an image on the back page of an Apple “mini book” RIGHT NOW, scroll down to Creating Custom Book Themes where all the technical step-by-step stuff begins. Alas, you’ll miss out on all the entertaining background minutia, and my usual distractible writing. Hey, I’ve been there too! So come back later and re-read for your enjoyment! Several months back I took a break from my usual ramblings on art, music, and pop culture to write an exhaustively long post on how to copy and reuse adjustment brush masks in Aperture, Apple’s high end photo management software. That post was born from my frustration with what I perceived to be a sorely missing feature in Aperture, and has proven to be wildly successful with photographers who, like me, spend ungodly hours fine tuning every last visual aspect of the images they capture. Being an engineer by training, it has long been my belief that anything is possible; it’s all just software. Send a man to the moon—software. Rig a presidential election in a third world country—software. Time travel is within our grasp. It’s all just software. Take the horror classic, The Fly (either the 1958 original, or the 1986 remake starring Jeff Goldblum). How do you think he made all that magical atoms-flying-through-thin-air teleportation possible? Software! And why did he end up becoming a mutated half-man half-fly? Yes, that’s right! It was clearly a software bug (no pun intended). With just one line of code, disaster could have been averted! So, yeah, software. If Apple’s software doesn’t do what I want… I’ll just figure out how it works and see if I can come up with a creative solution to make it perform as I wish. Recently, I had yet another occasion to devise a workaround to a limitation in Aperture, and I thought I’d share it with the rest of the digital photo community. 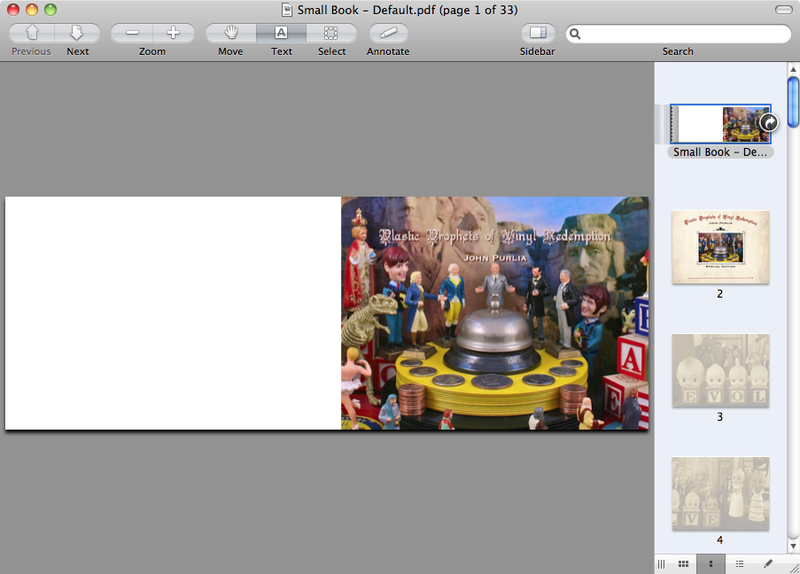 This little bit of software mayhem involves the design and customization of Aperture book themes. By no means, though, is this going to be an exhaustive study on the subject, but it will hopefully provide you with just enough information about how the themes work and can be modified. Moreover, my example will show you how to do something not otherwise possible with Apple’s built-in themes: produce mini books with custom back covers. 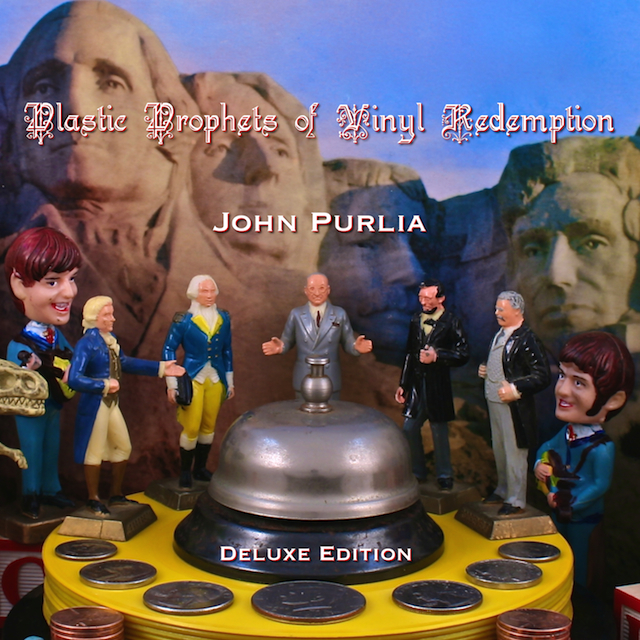 Over the past couple of months I’ve been working on producing a Deluxe Edition package for Plastic Prophets of Vinyl Redemption, the digital coffee table book of my photography I created for the iPad. The deluxe package delivers the digital book on a flash drive worn around the neck of a kewpie doll packaged inside a custom designed box. A bunch of additional features are also stored on the flash drive and included inside the box: PDFs, desktop patterns, stickers, a COA, and other things. One of the extra special features is a limited edition 32 page “mini book” containing many of the full page images from the digital book. 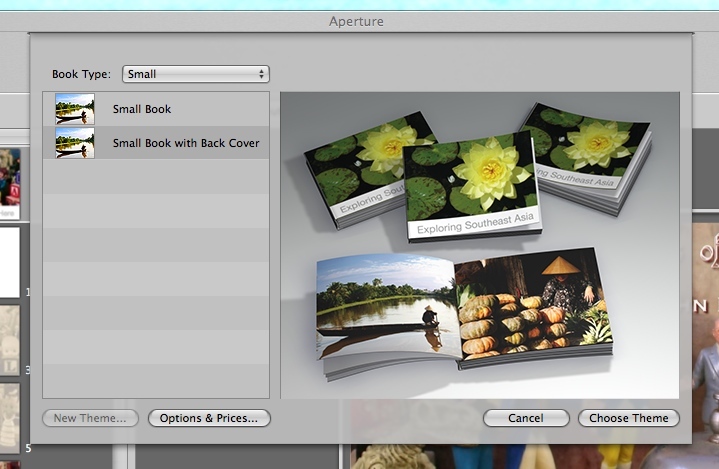 I used Aperture to design the mini books, which Apple prints at 3.5 x 2.6 inches with a soft bound, wraparound cover. Cool, right? You can have any back cover you want… as long as it is white. Ugh! In designing the mini book to accompany the deluxe edition of Plastic Prophets, I was disappointed to discover that the one and only Small Book theme does not allow customization of the book’s back cover. 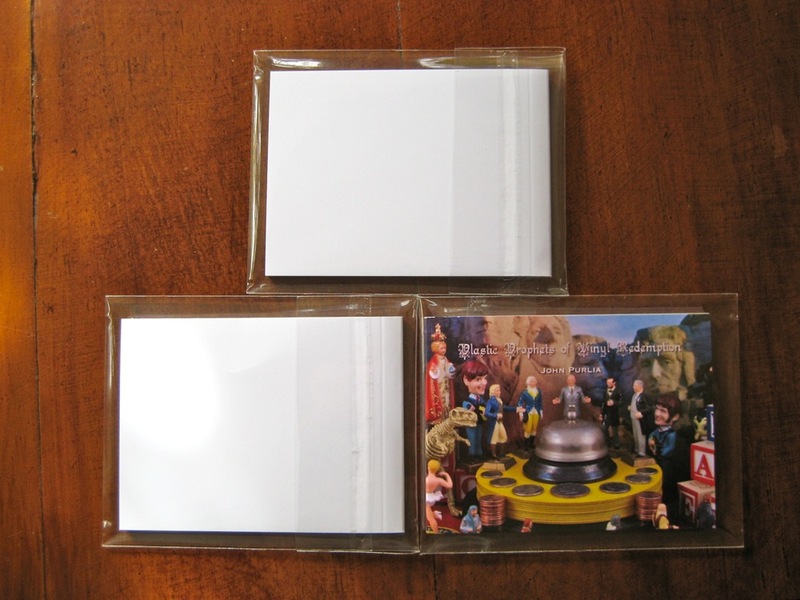 Most other themes provide this capability, either by setting the front cover to be a two page spread (back on the left, front on the right), or providing a dedicated Back Cover page as the last page layout in the book. No such luck when laying out a small book! By default, the layout of the front page consists of a large photo occupying the upper three fourths of the cover, with space below to provide a title on a white background. Kind of boring, but like any page in Aperture’s book design interface, the layout can be modified in all kinds of way: photo cells can be resized, text boxes can be changed, and the background of the page can be set to a different color (though, alas, not in the Small Book theme). For my book, I removed the title field and expanded the photo box to fill the page. I then dropped in my cover page, which I had designed in another application and previously imported into Aperture as a large JPEG. To the left is a screen capture showing the initial cover page in place. The arrow points to the disclosure triangle that, when clicked, normally displays a popup menu of the cover layout choices for the current book theme. However, no matter how hard you press, no matter how long you hold down the Control key, and no matter how much you wish and hope… there’s no way to get the Small Book theme to show the popup that would otherwise allow you to select a different cover page layout. There are no additional cover layout options for the Small Book theme! Likewise, scroll to the bottom of the page list where, in other themes, you are able to select the last page in your book and choose from one or more back cover layouts, and you discover that the last page in the list is just that… a normal page; the last to be printed inside the book before what you had hoped to be a custom back page. No way to change that in Apple’s Small Book theme. Boo! Hiss! Last page layout options — no back cover! Resigned to these limitations, I went ahead and ordered the requisite 3-pack. I mean, no back cover is better than no book at all, right? Here’s the set of books as they arrived from Apple (love the little individually wrapped plastic pouches!). The books are, of course, very nicely printed, and look great inside and ou- Oh, wait… Okay, they look great inside, and they look half-great outside. That bare back page just looks so ridiculously incomplete! Agree? Of course you do! Wouldn’t the book look so much better with a printed back cover? Again, you agree! And so I put the now seldom used engineering part of my brain to work figuring out how I could get Aperture and Apple to put something wonderful on that frustratingly vacant back page. Before we get to the “How I Did It” good stuff (and feel free to scroll down to the discussion of how to create custom book themes), let’s take a look at some of my failed attempts to print on the back cover, and perhaps learn something about how Aperture books work. It’s obvious that Apple’s print labs have the capability of printing on the back cover, as that feature exists for all other softcover book sizes. In fact, Aperture actually generates a back cover for small softcover books—it’s simply blank. Let’s take a peek at the PDF. Ah ha! See that? The first page of the PDF generated by Aperture is a double-wide page that combines your illustrated front cover with a blank back cover, which will be printed on a single 7.59″ x 2.75″ sheet of paper that wraps around the interior pages to form the front and back covers—just like we saw in the printed test books. Wait a second! 7.59 inches?!?! Isn’t that a LOT wider than two small pages? Yep! We’ll have more to say on that intriguing topic in a bit, but first, let’s consider the PDF. If this is the source delivered to Apple and subsequently fed into their printers, doesn’t it make sense that an image placed on the left side of that looooooong page would also be printed? I mean—come on!—it’s the same piece of paper! Right? My first thought to force Apple to print a back cover was to intercept the PDF file at the Preview Book stage, modify the first page of the PDF with a back cover image, replace the PDF in its super secret temporary folder, and then allow Aperture to blissfully continue with the Buy Book process. Brilliant! Oh yes, Aperture dutifully uploaded my Franken-PDF to Apple’s print servers, where it was summarily rejected with an email claim of “a problem with my order.” I tried all kinds of things to get the servers to accept a modified PDF file: simply annotating the back cover space, deleting a page, changing the file’s modification date, and more. But every attempt resulted in a failed order. Aperture itself seemed to be happy with my changes, with the failures always coming on the back end. As near as I can tell (and I didn’t go to the trouble of confirming this 100%, so take my theory with a grain of salt) Aperture likely tells the print service, “Hey! I’m about to send you a big ol’ file, and that file is EXACTLY 42 bazillion and 12 bytes long!” The print service gets all happy, makes room for a gigantic file, and waits for all that glorious book data to arrive. The print service (though generally happy) is also more than a little inflexible and insists that the file it receives is precisely the length that Aperture told it to expect. One byte too many, one byte too few; and the print service becomes annoyed, assuming that Something Bad Happened™ when Aperture tried to deliver the book over the sometimes flakey internet. Basically, this is standard Computer Science 101, protecting the customer from receiving something they had not expected. If the PDF could not be changed it only made sense that a better workaround would be to somehow get Aperture to generate a PDF with a back cover for me. The pesky print service would be no wiser, and—hopefully—would print an image in the space reserved for the blank back cover. For this example I’m going to create a new version of Apple’s one-and-only “mini book” theme, Small Book, adding the otherwise missing ability to layout back cover designs. 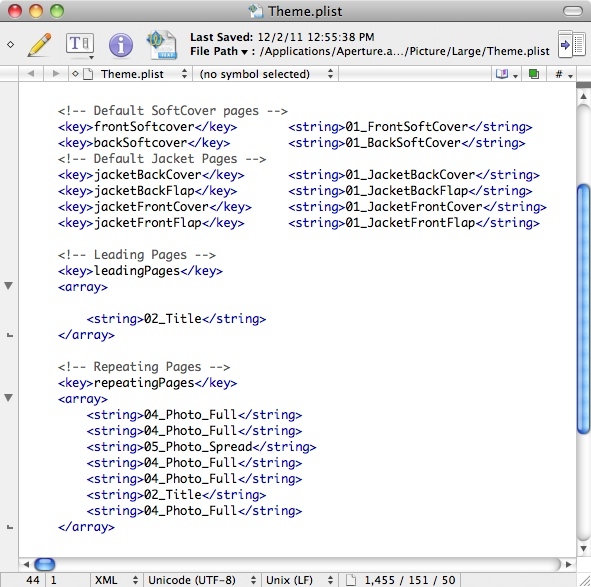 As you might suspect, Aperture stores its book themes inside the application package. Each folder contains the set of files that together define the features and layout options that are available when designing a book of that theme and size. If you were to create an extra large book based on the Art Collection theme, the features of the theme and your design options will be dictated by the files inside Art Collection : ExtraLarge. 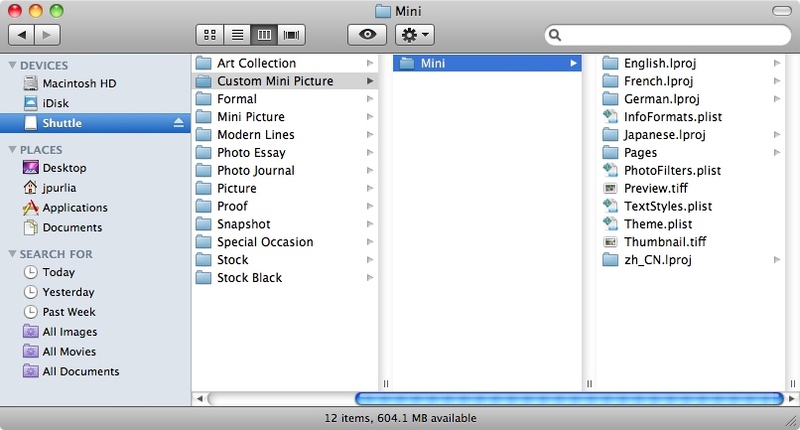 Only one book theme includes a Mini folder, that being Mini Picture, and that’s exactly where we’ll find the definition files for the Small Book theme. To be on the safe side, we’ll copy Mini Picture to a safe location outside the Aperture package where we can more easily make changes. This copy of Mini Picture (which we’ll call Custom Mini Picture) will be the basis for our brand new book theme that will support back cover layouts. Let’s take a look at the files and folders contained inside the root directory of Mini. 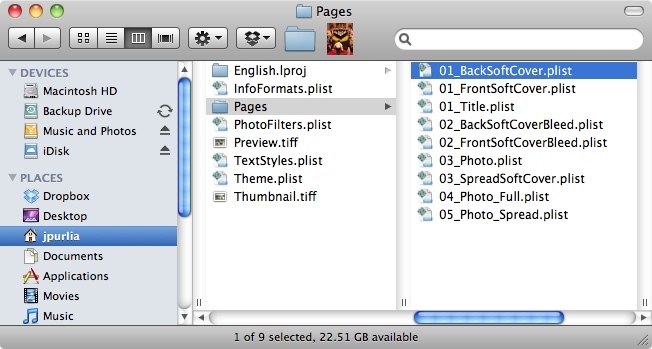 Remember, our focus is going to be on providing support for back cover layouts, so we’ll talk about the folder contents in three parts: Image Files, Nice To Know, and The Essentials. That’s right, the first two sections don’t really play a role in customizing the back cover, so feel free to skim your way down to those juicy essentials. Or, stick around for a quick introduction to other aspects of theme customization. Preview.tiff is an image file Aperture displays in the Theme picker dialog to illustrate how books created with this theme will appear when printed. Similarly, Thumbnail.tiff is used by the Theme picker to represent the book in the list of book themes. You can provide your own TIFF images with these names to give your book a custom look in the theme picker. I left these images untouched in my custom theme, choosing instead to distinguish my theme simply by its name. These three files allow you to define the default appearance of various book design capabilities such as EXIF display formats, photo color washes, and (duh) text styles. For example, if your theme would benefit from images that sport overly saturated colors, you could add a new item to the Photo Filter popup by modifying the contents of PhotoFilters.plist. We’ll save the details of how to do this for another post! 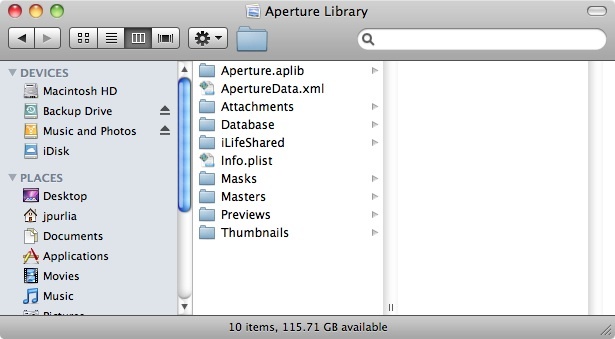 Aperture provides further theme customization opportunity via an additional set of files and folders in the root folder of a theme (though not present in Apple’s Small Book theme). These customizations include definitions for background colors, picture frames, and other graphic elements. Like the filter, format and text styles above, we’re going to defer in-depth discussion for a future post. Basic source control, and usually set to 1, though if changes are made to a theme this number would be changed. Theme.plist also includes terms that dictate the placement of page numbers (pageNumberMargin), as well as those that identify default settings for the text style and EXIF formatting items discussed above under “Nice To Know” (defaultTextStyle and defaultInfoFormat, respectively). Browsing around Apple’s collection of themes and you’ll also encounter items that specify map styles (defaultMapStyle in the Photo Essay and Journal themes), prevent photo frames from being resized (disableFrameScaleAndRotation) and… well, there’s a dictionary item called size that remains a bit of a mystery. That’s it. 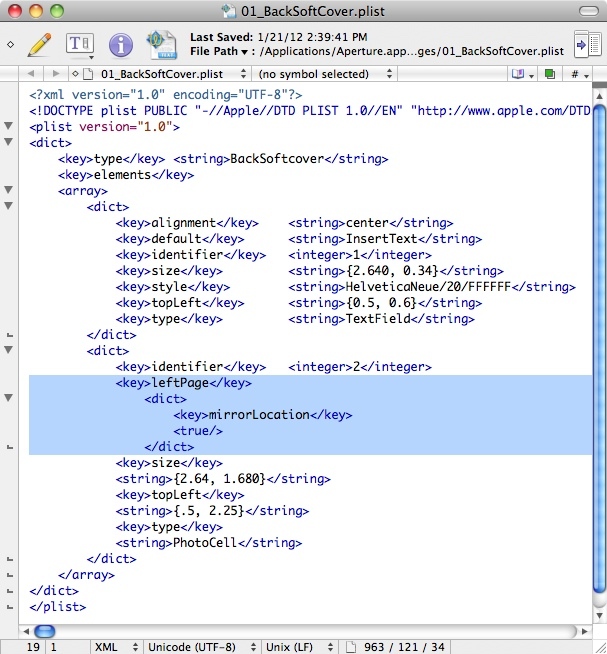 Only two of the four layouts is defined, and neither dictionary item is an array of XML terms. Aperture possesses lots of internal logic for the treatment of covers, and relies on the presence of frontSoftcover and backSoftCover to define the structural “root” for those book elements. We’ll get back to Theme.plist in a moment to begin making changes for our custom theme. First, though, to dig a little deeper into the anatomy of Aperture page layouts, let’s continue examining the contents of the theme folder. 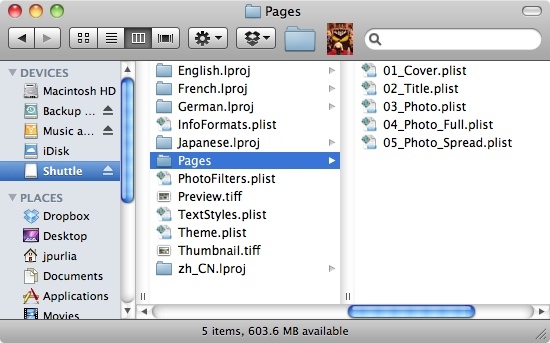 Each of these folders contains a single file—Localizable.strings—that Aperture uses within its user interface to communicate information back to the user in his or her chosen language. 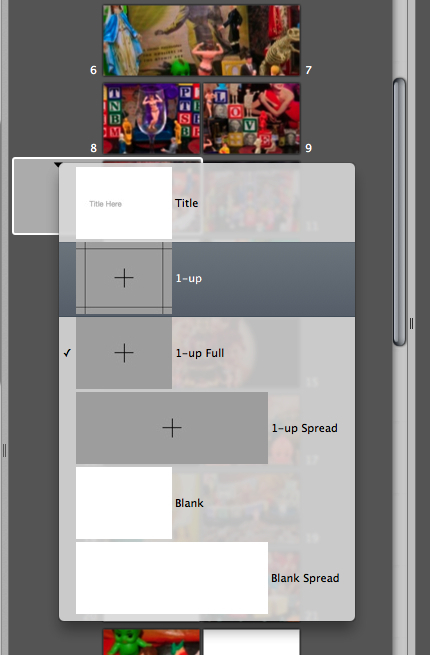 You might assume that this file is inconsequential when extending the design capabililites of an existing theme. You would be woefully wrong! While the file does contain language translations, it is also used to define various theme capabilities, including available background colors, filters, photo frames, and… page layout options. You should immediately recognize the strings on the right side of each definition as text that appears in the popup menu when changing page layouts, as illustrated in the example to the right. You’ll also notice that a portion of the left side, 01_Cover, matches what we saw in the frontSoftcover term in the Theme.plist file. Astute readers will notice that there is no corresponding plist file for the identifier, pages.06_Blank, which otherwise appears in the Localizable.strings file. As you might guess, there’s generally no need to define a page layout when that page is intended to be blank… as long as the pages of your book are white! Some book themes (notably, Stock Black) include a layout for blank pages, if only to specify that the background color of that page is black. Even though a page layout file may not be necessary, an identifier for blank pages should still be included in Localizable.strings to provide that menu option when laying out a book—and Aperture applies its own internal logic to do “all the right things” with blank pages. Which is where we can find the XML code that produces the default cover page layout for the Small Book theme. Where do these page layout identifiers come from? The format of the page layout identifiers is very important, and seems to dictate how Aperture will apply logic to the availability of each page layout as a book is being designed. Exactly how this logic is applied and how the desired behavior dictates the name and number components of an identifier remains a bit of a mystery. I suspect that the relationship is somehow defined in portions of the application I’ve as yet been unable to explore. In any case, my experience has shown that there is a fairly strict set of identifiers, and the page definition strings in custom themes must match these identifiers exactly. Luckily, defining page definition strings for front and back covers is fairly straightforward, following a (mostly) predictable pattern, and that will suit us just fine in our effort to create back covers for Apple’s mini books. From the examination of other softcover themes, Aperture offers two front cover layout variations, two back cover variations, and a single front’n’back wraparound spread. There are additionally a handful of theme-specific (and mostly legacy) cover layouts that don’t follow the general pattern we’ll discuss here, as well as a fairly robust suite of variants for laying out front and back cover flaps (which apply to only hardcover books). No back cover, no two-page spread option. No wonder you’re not able to design a back cover! Creating Custom Book Themes — Let’s make changes! For our modified theme we want to introduce back cover layouts, and provide a wider selection of choices when designing front covers (including a two-page front’n’back wrap). 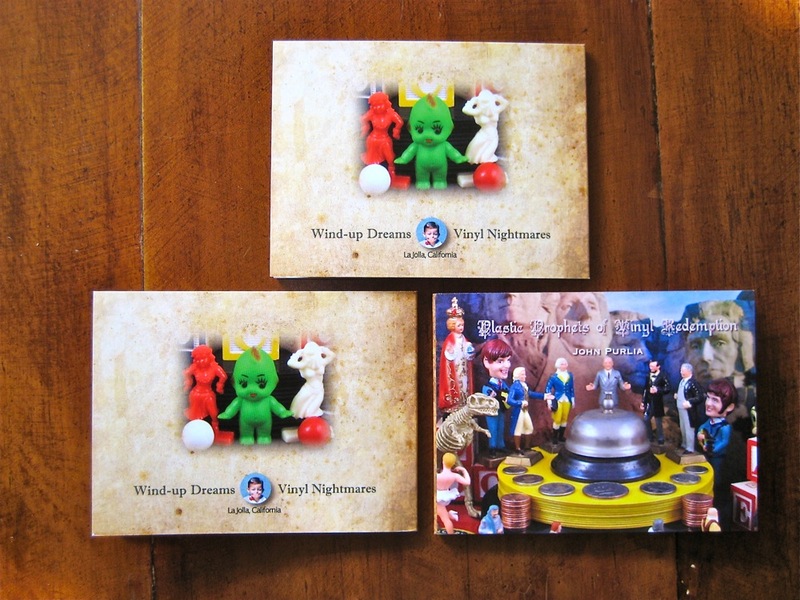 So let’s bring our Custom Mini Book up to par with other softcover books. In Theme.plist we’ll replace the above front cover term with terms for both the front and back covers. We’ll also add a little documentation, because documentation is good! Notice that we are also changing the string for the frontSoftcover to match the nomenclature used by other themes. Like documentation, consistency is also good! Those are the only changes required to Theme.plist. Save your work, and we’ll next redirect our attention to Localizable.strings. The first modification we’ll make is to the theme name. We can now focus our attention on the page layouts for each of our five new cover variations. 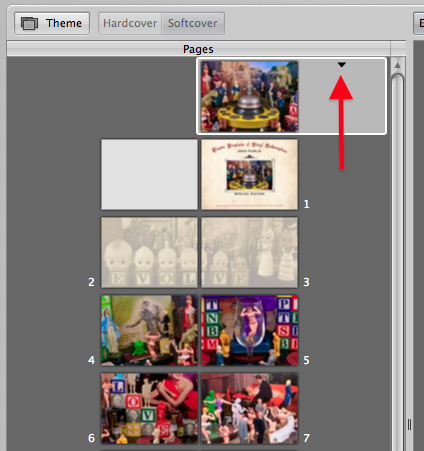 As we saw earlier, the layout for each page available in a given theme is stored in the Pages folder. 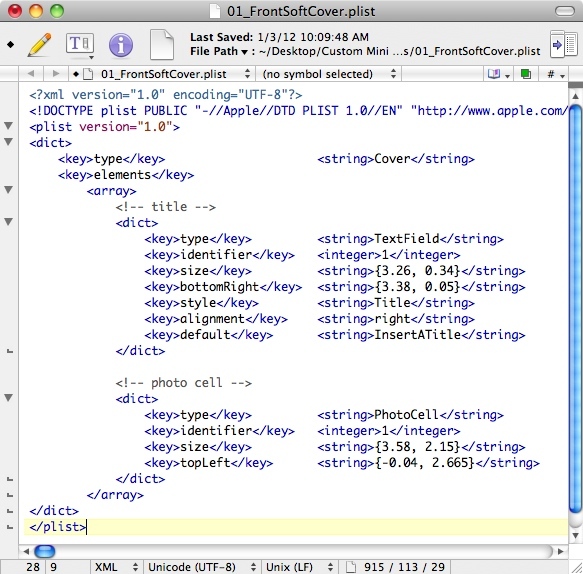 For the lone cover provided by Apple’s Small Book theme there was only one file, 01_Cover.plist, but as we saw above, we’ve changed instances of 01_Cover to 01_FrontSoftCover. We’ll likewise need to replace 01_Cover.plist with a new file, 01_FrontSoftCover.plist so that Aperture will be able to find our layout modifications. Let’s venture inside the file for a peek at how page layouts are structured. We won’t be making many changes, as we want to retain the default front cover layout in our custom theme. We will, however, use this opportunity to explore the file, and make note of several important highlights. Identifies this UI object on the page. I’m assuming that the identifier is intended to be unique and sequential, as this is the case for most other themes. This value is not unique, however, for the UI elements in the cover layout file of the Small Book theme. Apple sets the identifier value to 1 for both the photo cell and title text field, so I left these values unchanged in my custom theme. Specifies an anchor point for the UI object—i.e. “the top left corner of the object is at….” Aperture will render the UI element relative to this specified point. The location is expressed in absolute coordinates with the origin at the lower left corner of the page. Again, values are expressed in inches as: [x, y]. Specifies a name term found in the TextStyles.plist file that identifies the default style to be used for rendering text typed into this field. Identifies the default alignment characteristic for text typed into this field. Specifies an identifier mapping back to the Localizable.strings file, that will contain the default text to appear in this field when new pages are added to a book. For example, in Apple’s Small Book theme. the cover page layout specifies that the book’s title field defaults to the identifier: InsertATitle. A quick check at Localizable.strings reveals that InsertATitle is replaced by “TITLE HERE”, which is the text you’ll see in the title field when a Small Book is created. With our single change to the default cover page now in place, this file can be saved and we can go about the task of creating additional cover layouts for the front and back cover, as well as a two page spread that will print on the front and back. What about the rest of the cover pages? 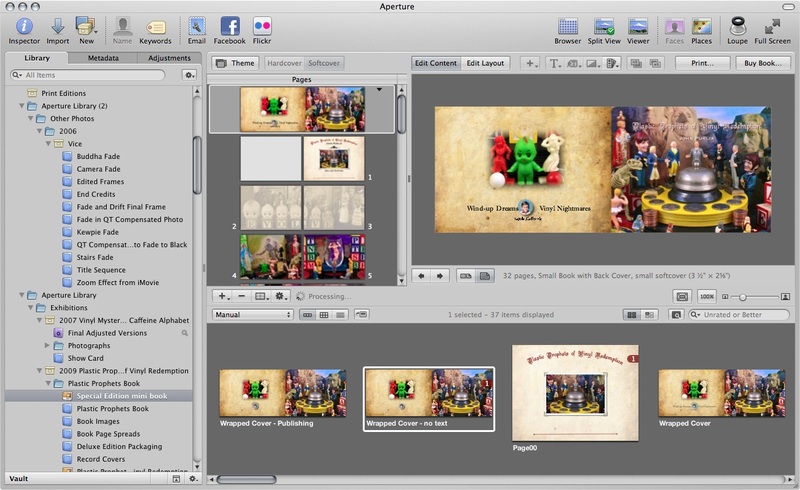 Now that we’ve seen how Aperture treats cover pages and page layout in general, we can define the remaining cover pages required for our custom mini book theme. But you don’t want to watch me type, do you? Nah! Instead, download my Custom Mini Book theme here, and follow along as we discuss aspects of the custom theme that provide the ability to provide bright and colorful back covers. Setting the spread attribute to true tells Aperture that the layout for this cover will encompass a pair of side-by-side pages, and trigger other logic that prevents specification of a standalone back page. Give it a try! 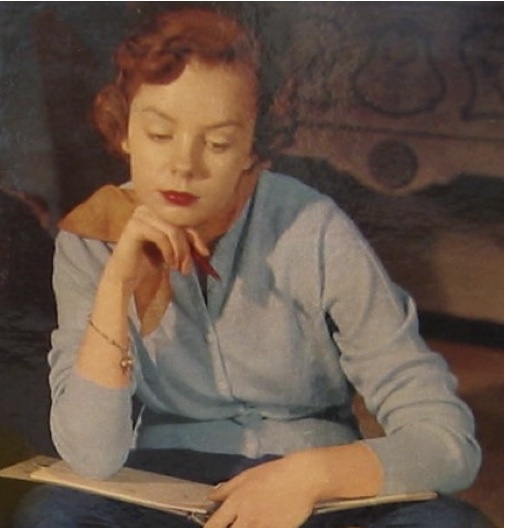 The last page of a book design can only se set to one of the various back cover choices when the front cover is not designed as a two-page spread. The second notable aspect of a two-page spread is the width of the PhotoCell element, which is set to 7.08 inches and placed at center of the two-page spread. 7.08 inches matches the width of a mini book’s internal spread pages, and provides for a little bit of edge bleed for photos dropped onto the page. This element is also placed relative to a center point—a nice, effective way to provide center alignment for UI objects. Custom Mini Picture book theme installed! Once your custom theme is installed it can be used like any other Aperture book theme, but now with all the new features you’ve added! Click on the Theme button in Aperture’s book interface, select “Small” from the Book Type popup, and you’ll find the new custom mini theme added to the list of available themes. With our custom theme selected we’re now able to modify the front cover design from a menu of several layout options, including a full bleed cover and the deluxe two-page wraparound design we sooooo covet. Multiple cover choices for mini books! And what about the back cover? Selectable page layouts for the back cover! Voila! We now have the ability to design a back cover for a mini book! Oh sure, it looks nice… but what about the PDF sent to Apple? And will Apple even accept such a monstrosity? I mean—come one!—front and back covers living in sin! Excellent questions! First, let’s go through the book buying process and preview the PDF file that results from our modifications. Remember, this is a small book designed to have separate front and back covers. What about those two strips of white space? One on the left, and one splitting the center between the front and back cover images? That looks… weird. Actually, it is completely normal for a softcover book! The thin strip in the center is expected. That’s where the single-piece, softcover, wraps to form the book spine. This strip matches the page background color. 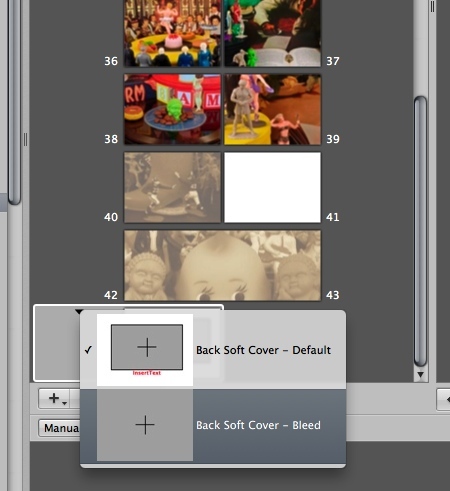 In the example above, since our custom theme doesn’t define a background color, Aperture assumes white. For other books the default is black, or tan, or some other color. Okay, I get that. It doesn’t look very good, but I get it. What about that other fat strip of white on the left? I admire you’re aesthetic, because—no—it does not look very sharp at all. But that is what you get when you place a full-bleed photos on the front and back covers. We’ll take a look at a more effective design in a moment, but first let’s discuss the “fat strip” on the left. Remember the mystery of the 7.59″ wide PDF pages we discussed waaaaay back at the beginning of this post? Aperture generates that extra wide page for the front and back covers when preparing the PDF that will be sent to the print service. As we know, mini books are printed 3.5 inches wide, though, while the internal pages of the PDF are a bit wider at 3.63 inches to provide about an eighth of an inch of excess printing to insure a full bleed when the pages are cut. Two pages side by side would be roughly 7.25″ including the bleed for the front and back covers. That’s more than a third of an inch unaccounted for! What gives? Ah ha! There’s no ugly spin space at all! And what if we create the longest (100 page) book possible? So, as you can see, Aperture “slides” the back cover to the left as the number of pages increases, and trims whatever remains on the left edge before binding. Here, for a very thick book (nearly a half inch!) the white spine doesn’t look so bad. In fact, you may have created Large or Medium sized softcover books in the past with perfectly reasonable results. Alas, the margin for error for book binding shrinks with the size of the book, and who knows where that skinny bit of white will fall when assembling a thin book. Note how the default background color unifies the front and back covers. When the page is cut, and wrapped around the internal pages during binding, there’s a little bit of leeway in where the wide cover is folded at the spine. With a uniform color spilling from front to back, an error of a fraction of an inch isn’t going to be noticed. But where two full bleed images are separated by the skinny strip of white we saw in the PDF generated for out custom theme… a fraction of an inch is the difference between a sharp binding and a sloppy binding. I chose to skip support for background colors in my custom mini book theme, as I had a specific goal in mind for the back cover imagery I wanted to include in my special edition books. Luckily, adding support for backgrounds is relatively simple. 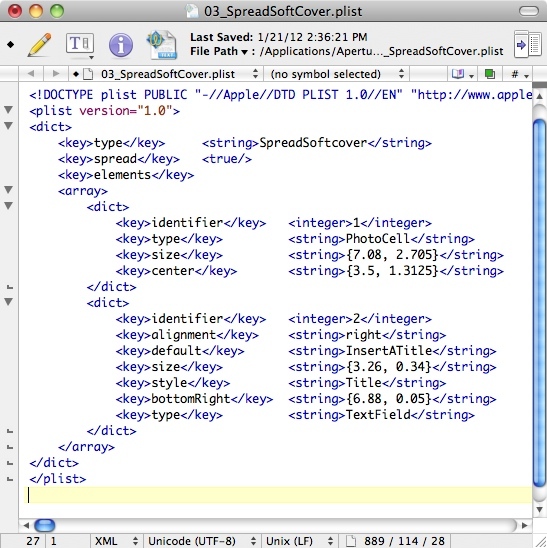 We’re not going to go into the details here, but it all comes down to adding a plist file that defines the RGB values for your background, placing that file in the Backgrounds folder, defining the background in Localizable.strings, and adding a reference to that definition as a dictionary term in the front and back cover page layout files. 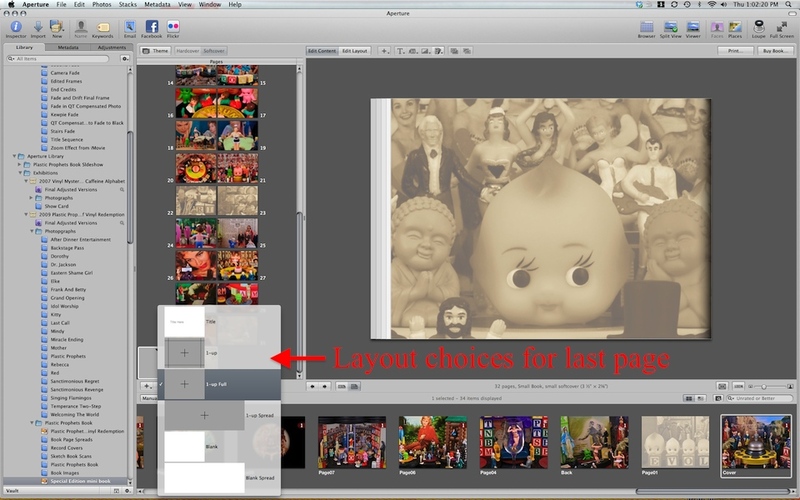 Take a look inside the Medium Picture Book theme and the process should be fairly clear. For my special edition mini book I wanted to create a colorful wrapped cover without white space on the spine. 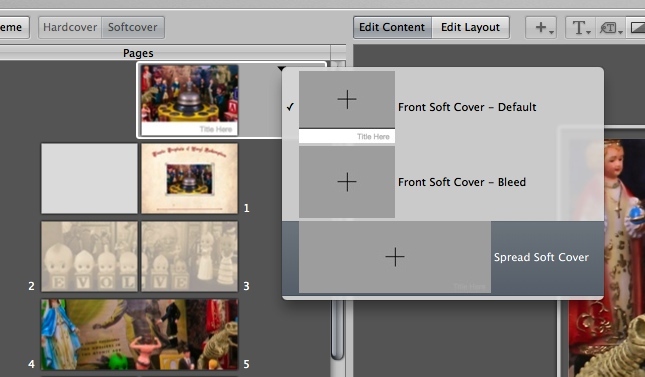 The solution was to set the front cover layout to Spread Soft Cover—one of the new cover variants added to the Custom Mini Picture theme. The cover graphics for the front/back spread was created in another application, then imported back into Aperture and dropped into the double-wide photo cell. Preparing this image required a bit of careful thought, however, as—even with a two-page spread—Aperture will generate the cover page in the PDF at 7.59″ wide. And as we’ve seen, that page will be trimmed to an overall width that accommodates the variable-width spine. As always is the case when printing an Aperture book, careful review of the Preview PDF prior to placing your order is highly recommended! As above, I was aware that a small amount of the left side of the back cover would be trimmed during binding, so I chose a textured background for the back cover that would easily “survive” any cut of the printer’s blade. I also right shifted the image and logo by just a little, again understanding where the left edge trim mark would be for a 32 page book. So… did it work when my custom theme mini book was sent to Apple? Mini books printed with full color back covers!! Feel free to use my custom mini book theme to provide back cover graphics for your mini books, and please contact me if you run into any problems or have questions about customizing book themes. And now… a short venture into technology — Aperture brushes unmasked! I thought I’d take a break from my usual ramblings about music and the arts for a quick little sidetrack into technology. So if you’re here to see what I think of the latest Woody Allen film (brilliant and Oscar-worthy!!) or were hoping to find a post about my newest photo (which features an anatomical view inside a giant kewpie)… come back later. Actually, that’s not entirely true; I’ll be using my latest photo as the backdrop for sharing a tip for using Aperture, Apple’s pro-level application I use to manage and adjust my photos. 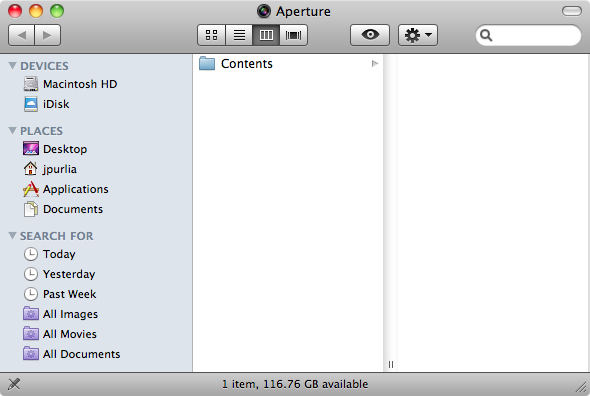 I’ve been using Aperture since its very first version when it represented a nice step up from iPhoto. Aperture provided the ability to apply a much wider range of adjustments to your photos: definition, vibrancy, tweaking individual colors, and more. In those early days, adjustments were applied evenly across an entire image, so you had to be very, very careful that adjustments did not collide with one another. A deft hand was required, for example, to marginally adjust the yellow petals of a flower without the unfortunate side effect of making any people in the photo appear as though they had acquired Hepatitis-C. The latest version of Aperture introduced the concept of brushes, which allow adjustments to be applied to very specific and well constrained areas of a photo without impacting the entire image. Think of Aperture brushes as the digital equivalent of applying an effect through a stencil that’s been placed over your image. In typical Apple fashion, a “brush” is really just an easier-to-understand name for much more complex computer science principles like layers, alpha channels and… masks. Lots of other applications foist these decidedly unfriendly concepts onto poor unsuspecting users, then go the extra step by building cumbersome user interfaces around these powerful tools. Aperture’s not like that. Instead, you have a brush. Easy. In my work, brushes have been both a blessing and a curse. Where in the past I had a finite set of tools for improving images en totale, I can now brush away to my heart’s content until EVERY LAST OBJECT ON THE SCEEEN has undergone the touch of my digital spell. It’s great! Though the Aperture brush feature provides a convenient way to detect the edges of an object as the brush is moved around the screen, this feature is not so sophisticated that it takes on the geographic capabilities of a paint-by-number canvas. Adjustments frequently “paint outside the lines”, and to this end brush strokes can be erased, sized, and adjusted for softness and opacity. I spend a lot of my postproduction time painstakingly outlining and filling in the dozens of irregularly shaped figures and objects that inhabit each of my photos. To illustrate, let’s take a look at a typical brushed in adjustment from my latest photo, Clinical study at the Mary Shelley School of Theologic Medicine. 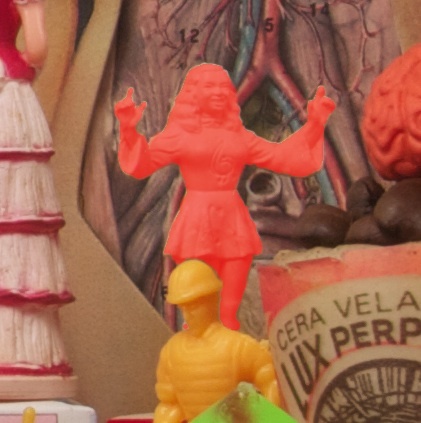 In the image to the right you see a color overlay of the brush I applied to add a little definition to a tiny plastic figure of a circus performer. Brushing around the roller coaster of nooks and crannies that define the figure takes a lot of time, but once complete I’m confident that the adjustment being applied will take effect on the entire object; nothing more. Great! Looks good. But what if I decide that the exact same object could benefit from another adjustment? Maybe a tweaking of the color tint or a touch of vibrancy? Surely, there must be a way to copy all that complex brushing from one adjustment to another. Usually I just bite the bullet, set the screen zoom back up to 150%, and draw in the new brush as my fingers cramp and my shoulders scream. While working on the new piece, and faced with several regions of the photo that could benefit from multiple adjustments, I finally reached my “re-brushing threshold” and developed a nice little process for applying the same brushing mask to multiple adjustments, thereby GREATLY reducing the time that would have otherwise been required for postproduction. Aperture applies each of its brushed adjustments through TIFF files, which (as stated earlier) act just like stencils. 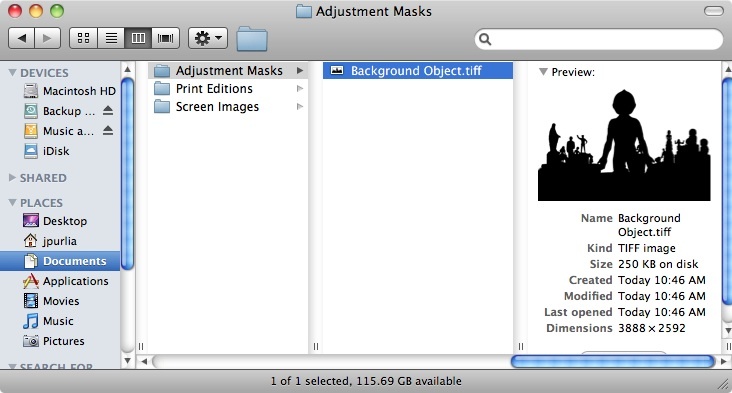 Each adjustment you make to a photo will have a corresponding TIFF file hidden away inside your Aperture Library. Change or move the TIFF files, and the area to which an adjustment is intended will change. The secret to copying a brush created for one adjustment, to a second adjustment, is finding the correct TIFF files and simply moving around some files. Easy! Well, it’s not quite that simple… A single brushed in adjustment can actually result in many, many TIFF files, each representing your progress in applying brush strokes, resting your hand, and applying more brush strokes for the same adjustment. Aperture keeps all these intermediate “half brushed” files around, so… it’s important to find The One True TIFF for the adjustment you wish to duplicate. Let’s dive right in and see how Aperture brushes can be copied from one image adjustment to another! For this example we’re going to be looking at one of my recent photos, Clinical study at the Mary Shelley School of Theologic Medicine. In this photo I wanted two different vignette effects — a subtle amount on objects in the foreground, but a much more aggressive effect on the background. I also wanted to apply edge sharpening over the background at different levels than I was anticipating for the foreground. So, for the background: two adjustments; one brush. Painting the adjustment around all of those foreground objects was no mean feat! I definitely did not want to go through that process again when it came time to add in edge sharpening. 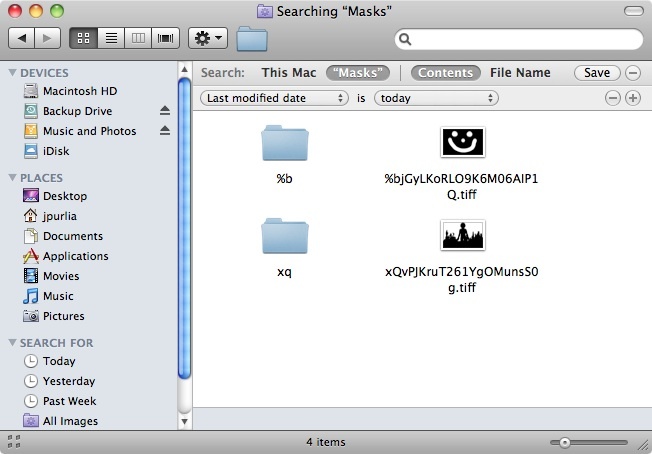 Note that one of the items in the Aperture Library is a Masks folder. 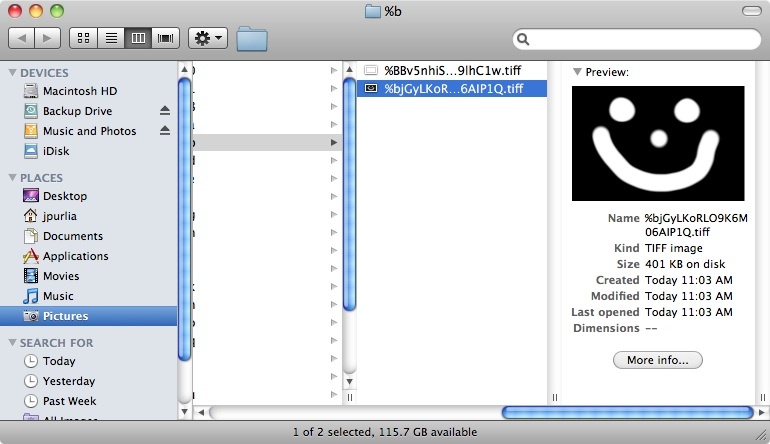 This is where Aperture stores the TIFF overlay for the brushed in adjustments for ALL of the photos in your library. If you regularly use brushes in your work, there will be a lot of deeply nested files and folders stored in Masks, and the TIFF files you encounter will not be, simply, “finished” brushes… you’ll also find plenty of work in progress, so it becomes very important that you find the one great and true TIFF file that defines your finished set of brush strokes. The Finder will display a typical search window from which you can look for the TIFF file that represents the adjustment you want to duplicate. In my case, it’s the vignette effect I just created. The results of my search is shown in the image above. That oddly named file on the right sure looks like the complex brush I just created, doesn’t it? You can verify that this is the correct file by checking the modification date and viewing it in Preview. I like to sort the results by “Date Modified” to make sure I’m finding the most recent version of the adjustment brush. Good news! 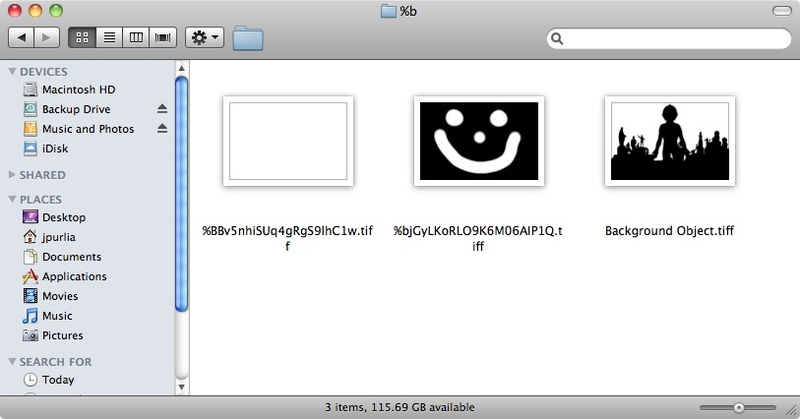 The Finder is once again able to search for files within package contents! 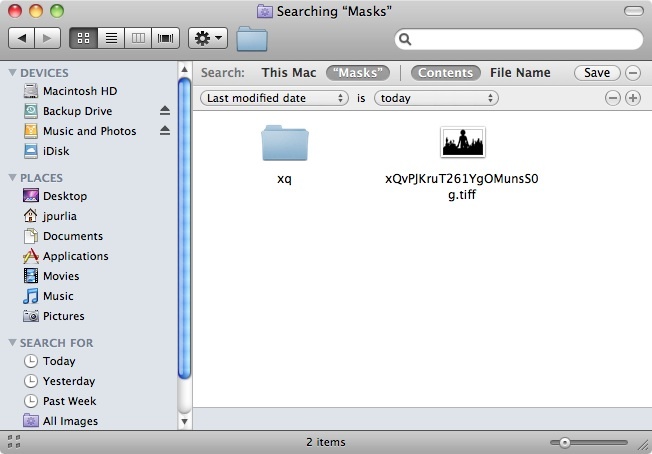 So, once you upgrade from Mavericks to Yosemite you will no longer need to find the changed masks using the Unix method described below. Yay!! What if you want to find a mask you created earlier in the day? Or yesterday? Or last week? There the task becomes a little more difficult, but certainly not impossible. The easiest approach is to open Aperture, locate the adjustment you wish to clone, and make a slight “non-change” to the brush by either quickly brushing over an area that is already brushed, or (preferred) erasing an area without the adjustment. All that’s needed is one quick touch of the brush and the modification date of the TIFF file will change (even though the brush does not). At this point it is a good idea to make a copy of the TIFF file and move the copy to a safe place for later use. I like to maintain an Adjustment Masks folder (in the Finder’s file system and outside of Aperture) for each of my photos for this very purpose. Don’t forget to option-drag when moving the file, otherwise your original brush will be lost! I also like to rename the file to something that will be easy to find when I want to apply a new adjustment to the same region of the photo. In the image below, the name of the file has been changed to Background Object. We can now focus on creating a brand new adjustment that will use the same brush shape we just saved. In the image above I am adding a the Edge Sharpen adjustment that I only want applied to the background — the exact same region that just received the prior Vignette adjustment. Quick brushing of Edge Sharpen — The shape is unimportant! There. We have now edge sharpened everything inside the smiley face. Of course, we don’t want to sharpen inside a smiley face; we want to sharpen inside the brushed region we previously created and saved for the vignette adjustment. As before, the Finder will display a search window where you can look for the TIFF file containing your quick, easily recognizable brush strokes. And there’s our smiley face! (The vignette mask is still there as well, and will be as long as you’re performing these operations in close proximity to one another.) Once again, it is important to verify that this is, indeed, the brush that was just created, so sort by “Date Modified”and make sure this really is the most recent version of your quick adjustment. We now want to replace the TIFF for the smiley face with the TIFF of the brush we had previously saved. Copy the previously saved TIFF file for the original adjustment into the folder containing the TIFF file for the new adjustment. Again, option-drag is your friend!! You want a copy, not necessarily the original file. Getting Aperture to apply the previously saved brush is now just a matter of changing the same of the saved TIFF file to match the name that Aperture had created for the brushed region we just created. As illustrated above, the TIFF file that Aperture will use to apply the new Edge Sharpen adjustment now contains the same shape we’d previously created for applying the vignette effect. Yay! There it is! No need to go through the agony of “repeat brushing” around all of those tiny, tiny figures! And that’s it for this little foray into technology. I hope this proves useful to you until such a time that Apple adds the ability to copy and paste brush masks in a future version of Aperture. I’ll be back posting about art and culture soon, though I do have one more pretty cool Trick of Technology up my sleeve for a future post. Think iPad, photography, and illustrated books made easy. I’ve always been fascinated with videos that capture an artist’s process, whether Hans Namuth’s great footage of Jackson Pollock slopping paint outside his country farmhouse, or Todd Schorr meticulously applying oil to canvas in The Treasures Of Long Gone John. Over the past couple of years I’ve created several stop motion or time lapse videos based on my photos, but I’ve always started with the finished image, working my way backwards, then reversing all the frames to create the illusion of a piece of art being created. For this brand new effort I attempted to capture the process I use in shooting my photos. When working on a new piece I go through a lot of trial and error as I build the stage and compose a narrative story. Figures move around, ideas come and go, I build the basic stage and then make very small adjustments to make sure every object is exactly where it needs to be. The subject for this experiment was a new photo, Hope, Charity and Jade summon forth a capricious blue world, which I began in late November and completed during the second week in December. I placed my trusty Canon SD1000 in the corner of my studio with the lens trained on the inside of the light tent where I build my constructions. Each time I entered the studio to continue work on the photo I’d flip on the camera and capture one frame every 2 seconds. The result of my little experiment was 7 or 8 days of actual work squeezed down into 6 or 7 minutes of fast pasted video footage. And, an over-the-shoulder view into my creative process, from an initially messy “palette” of characters, to a finished construction that became the source subject for Hope, Charity and Jade summon forth a capricious blue world. Check out the full video above, or venture over to YouTube for higher resolution. 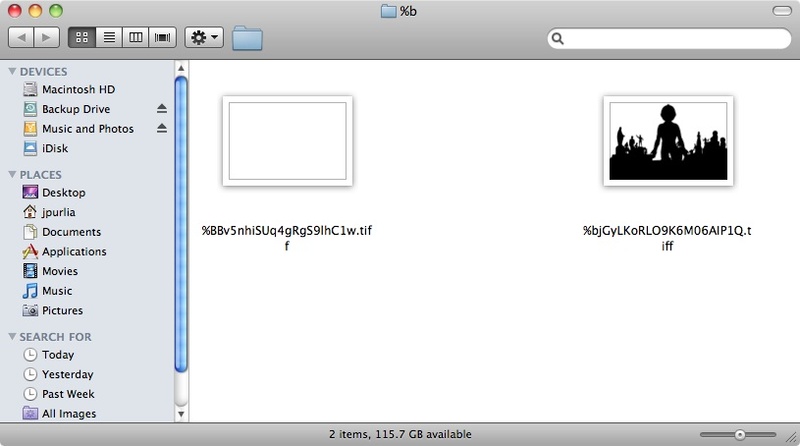 Did you know that on any Mac running Snow Leopard, you can use MobileMe Gallery public albums as a screensaver? Now that we have our collection of amazing album covers available online, you can enjoy break time even more by having lovely album covers dance across your screen. Simply use the Desktop & Screen Saver tab in System Preferences, click the plus sign and choose Add MobileMe Gallery. Then enter “jpurlia” as the Member name. Choose the Cover Collection gallery and/or the Wind-up Dreams & Vinyl Nightmares gallery, the effects you’d like to apply, and click OK. Next time your screen saver starts, it will use pictures from the album(s) you selected. Easy peasy! And once the screen saver is setup, it will automatically include new covers and photos as we add them to the MobileMe gallery. I just tested it out and what fun it is to look through these album covers and photos! So if friends or family are using your computer and ask you where you got the cool screen saver from, please feel free to share the love. Drop us a line and let us know what you think! And don’t forget our April 15% off sale going on now! A reminder from the good folks at Apple: For the best MobileMe experience, you should be using Mac OS X v10.6.2 Snow Leopard (on a Mac), MobileMe Control Panel 1.5 (on a PC), iTunes 9 (Mac or PC), and iPhone OS 3.1 (on iPhone or iPod touch). Consider, for a moment, the personalized license plate: a crossword clue of personal, mobile expression for drivers and pedestrians alike to puzzle through some tiny aspect of one’s personality. I have two of these cryptic banners, neither of which have anything to do with me, personally, but both make mild statements of who I am and what I like. Ah, but this is just a snapshot of my ego! Limited to 7 characters of vanity, and revealed only to those who come upon my bumper. So inadequate as a marketing medium for self-absorbed personal advertisement! The Internet, where anyone can flaunt his or her personality to billions of eyes across the globe! The Internet, where information is vast! The Internet, where time stands still, and change moves at lightning speeds! The Internet, where for very little money anyone can claim their very own personal domain name! And now… I have mine! That’s right, I now I have my own domain. Of course, you can still get to my site from the old webmacblahblahblahblahslashjpurlia address (after all, you’re here, right? 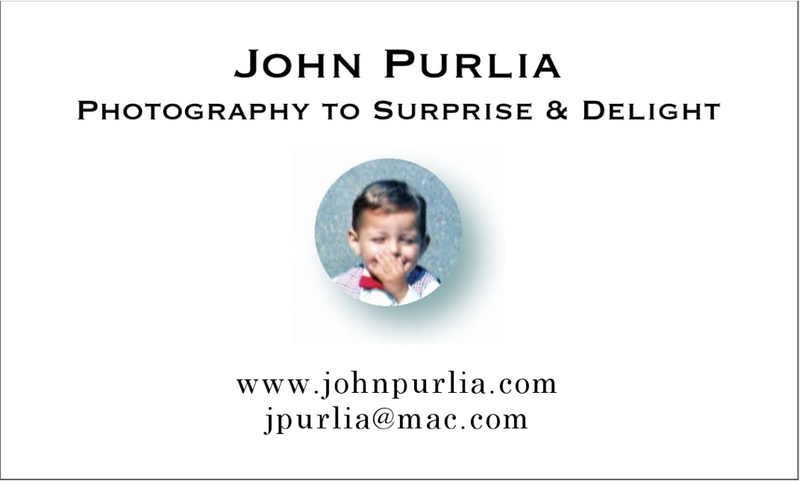 ), but look at how much more professional it looks on my new business cards? Update your bookmarks, and all that….